The market’s wild ride continued for a third straight week as sharp volatility was seen in the major averages this past week. 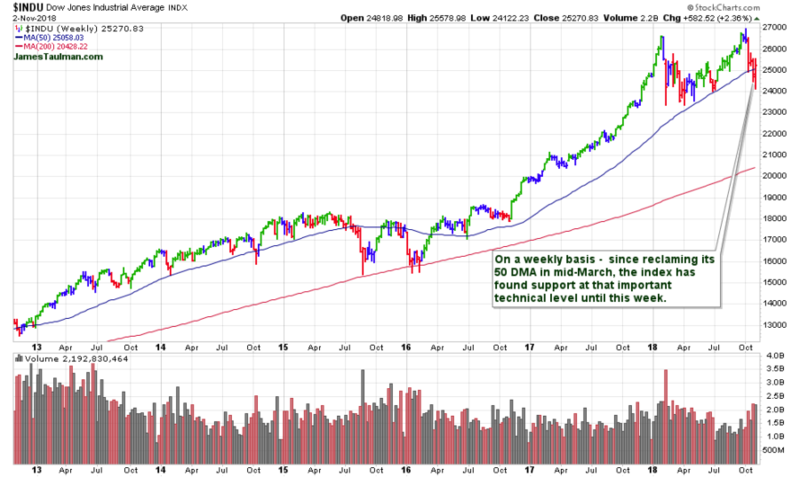 After the market dropped to a 6-month low on Monday, it rose for the next three days, albeit on unconvincing volume which did not confirm a new uptrend. Then on Friday we had another selloff amid conflicting signals from the Trump administration on the state of U.S.-China trade talks. On a weekly basis the Dow and the S&P 500 ended up +2.4% as the Nasdaq advanced +2.7%, its first weekly gain since the end of September. The events scheduled for this week will continue to keep the action interesting. On Tuesday evening we should have enough of the mid-term election results, to get a reaction from the market on Wednesday morning. Also, there is the Federal Reserve. The central bank has a two-day meeting that will end Thursday, and policy makers are fully expected to leave interest rates unchanged at 2%–2.25%. However, keep in mind it is expected to raise them by .25 basis points at its December meeting. Fed funds futures prescribe a 72% probability to a December hike. Throughout the week, we will also have earnings announcements from companies which will report their 3rd quarter results. Finally, we will continue to have more news on the U.S/China trade war which has been a leaning factor in the market’s daily gyrations. I mention these events, yet I do not specifically trade events. Whether they are earnings announcements, interest rate decisions, or election results. You have to guess the outcome of the event and then guess the market’s reaction to the event. As we clearly seen with the 2016 presidential election – many said that Hillary would win, and also if Trump did win, the market would crash. Both predictions were wrong and many investors were caught flat-footed as a new rally quickly blossomed. All we did was what we always do – maintain a watch list of high-ranked leaders setting up in bullish bases and then buy any stocks from that list which breakout. We still have yet to have a proper Follow-Through Day, and although this past week’s breakouts have not failed, they are still fledgling. Keep in mind that three of the four were earnings breakouts, not traditional non-news breakouts which we normally like to see. We could get the start of another rally-run sparked by the results of Tuesday’s mid-terms. 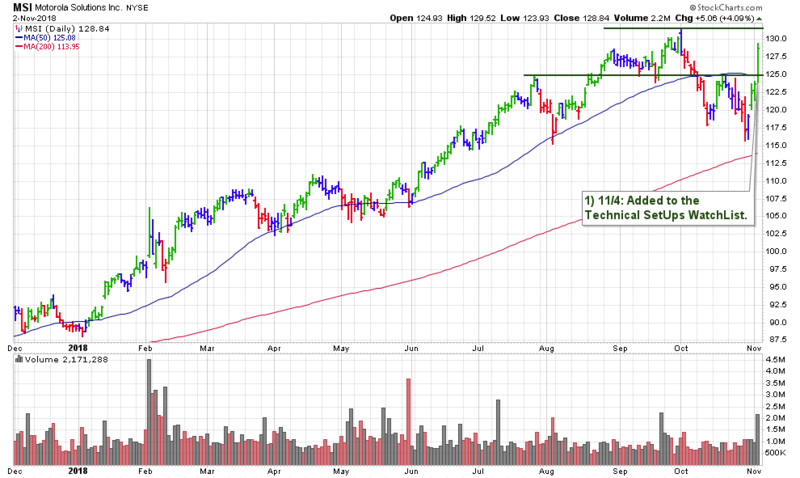 Then from there, any breakouts from our watch list would be more prudently buyable. As I have have always preached – no matter the market you should be continually running stock screens and maintaining a watch list of high-ranked leaders which are setting up in bullish technical bases. 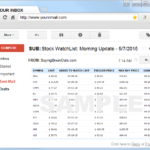 I ran my regular stock screens over the weekend and added 4 new stocks to our watch list. One in particular is MSI which made a sharp advance on Friday of +4% on earnings. 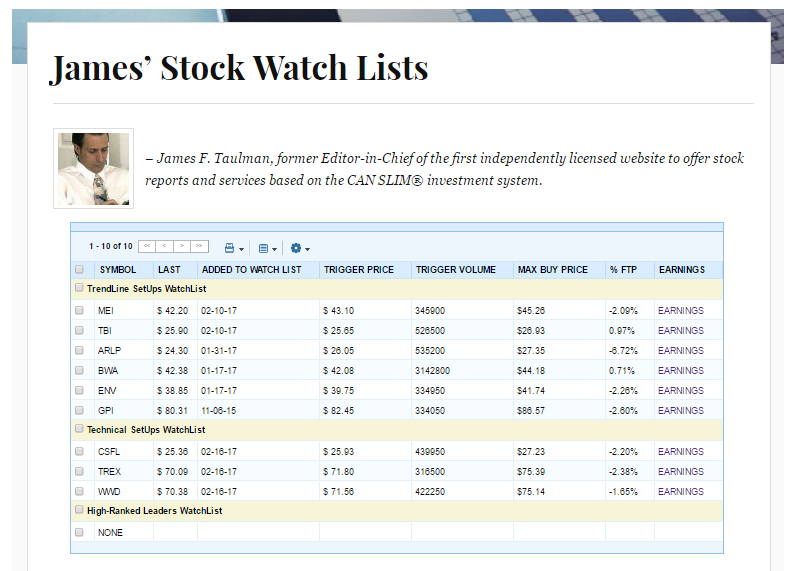 The stock is ranked second in the group to number one ranked AAPL.